We are bringing back a crew and customer favorite in Oakland and Berkeley! 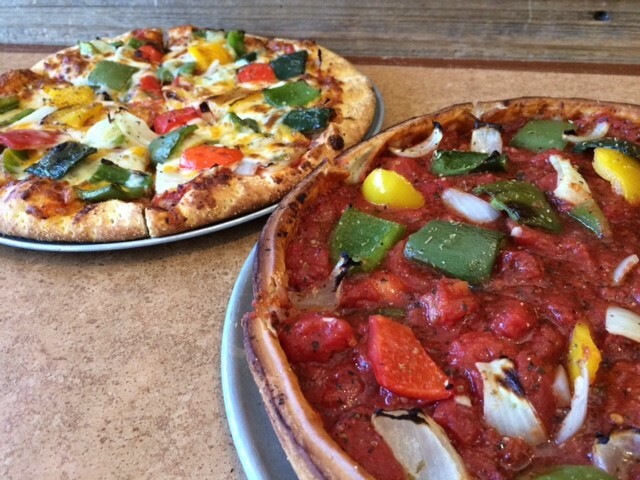 Our Roasted Pepper pizza is a dream pie for veggie lovers! It’s filled with red, green, and yellow bell peppers, Anaheim chiles, Pasilla peppers, and onion. We finish it off with lots of Monterey Jack and cheddar cheese. It’s available stuffed or thin crust for a limited time only. 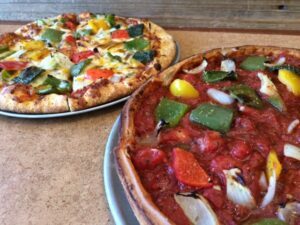 Ask one of our veteran employee owners about the best way to order the Roasted Pepper pizza and they will certainly suggest that you add pepperoni to the top. Putting pepperoni on top gives this pie a crunchy pop that perfectly compliments the smokiness of the roasted peppers. Yes please! 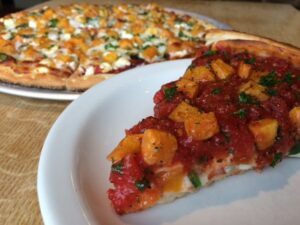 Our San Ramon and Pleasant Hill locations are keeping the Butternut Squash pizza around for a few more weeks. This popular pie has roasted butternut squash, goat cheese, spinach, red onion, fresh parsley and mozzarella. It’s also available stuffed or thin crust. This pizza is the brainchild of employee owner Justin Lassen. He credits the pizza creation to “the healthy appetites of the San Ramon employee owners” who helped sample lots of trial runs (poor little dears! ).